Are you looking for a high quality cross country hardtail to take you to new heights? Then the Norco Revolver is a range worth checking out. There is a huge variety to choose from, ranging from the lower midrange prices to the high end. All of these bikes offer excellent quality, so you should be able to find one for your needs. Norco Bicycles has been around for over fifty years now, and has some world famous names on their team, so you can be sure that they know what they’re doing. We certainly had high expectations for the bikes we got to review. For the most part, they definitely delivered. You might have to shell out for some high quality carbon fiber frames, but it is definitely worth it if you want a good shot at winning. We tested these bikes out over a few days and several different types of terrain. Overall, these bikes performed really well, eating up road like a monster, especially the 29ers. Combination SRAM and Tektro componentry works well, but some of the models had subpar equipment for the price. Some of the bikes lack a good amount of travel as well. What you are paying for really is the carbon frames, so this is understandable. Norco’s own finishing kit is comfy, making these bikes especially suitable for long rides. A great choice of mid to high range bike that is well suited for road, cross country, or trail riding. 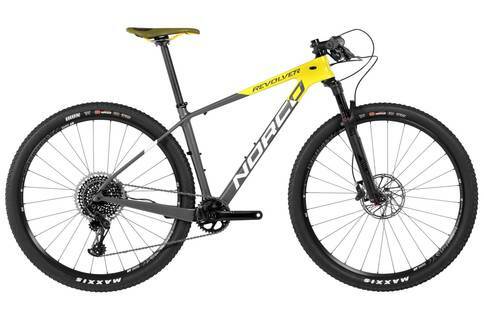 Experienced mountain bike and road cyclists will definitely love the Norco Revolver bikes. The geometry, high quality specs, and full carbon frames make for real winners. It might take a bit of time to make the right selection for your budget and needs, but it will be well worth the price tag.